NEW Cardio Equipment at the Parkway! Have you had the opportunity to check out the new cardio equipment on the Parkway gym floor? Our new cardio equipment offers a more interactive experience (access to internet, Spotify, Netflix and more) and new state-of-the-art features to help you reach your fitness goals. Treadmills (True Fitness) offer the largest running surface of any commercial treadmill on the market as well as the highest max speed. Alpine Runners (True Fitness) allow you to climb to new heights and reach an astonishing 30-degree incline! Ellipticals (Precor & True Fitness) offering three types of machines – fixed arms, moving arms and adjustable stride length. Upright and Recumbent Bikes (Precor) offer a fresh feel and a highly interactive, high-tech user experience. Step Mills (StairMaster) will push you to new limits – a staple of any solid cardio routine. To arrange a personalized orientation of the new equipment please contact Joseph Harwood, Fitness Manager at 905-475-0350 ext. 3252 or jharwood@mayfairclubs.com. Save the courts fees this summer by purchasing a Summer Play Pass! This pass applies to your portion of the court fee and allows you to book 2 tennis court hours for casual play each day (singles or doubles) and then additional hours after that. Please ask for details. For details and to confirm which option applies to your Tennis Pro, please speak with Front Desk or the Tennis Department. The best junior tennis players from across Canada will be playing at Mayfair East in the Nationals Qualifying Event (March 29th & 30th) and the Under-18 Canadian Junior National Championships (March 31st – April 5th). Visit Mayfair East to see the future stars of Canadian tennis playing both singles and doubles. Please note, court availability for members will be affected during the tournament. For those who love competition and meeting new friends, our annual Singles, Doubles and Mixed Doubles Tournaments are coming soon! Prizes for the Winners and Finalists in each draw. Your entry fee includes a minimum of 2 matches in each event, the Championship Awards Night Dinner & Party. Prizes for the Winners and Finalists in each draw. To register for any of the Club Championship events, please contact Ed Flanigan @ parkwaytennis@mayfairclubs.com or at 905.475.0350 ext. 3521. All Club Championship Tournament Finals will be held on Saturday, May 11 at Mayfair from 12:30 pm to 6:30 pm. Join us on Wednesday, May 15 beginning at 7:00 pm for our season ending dinner, awards ceremony, presentations and party. This class is designed for beginners wanting to learn the game of squash. During these classes you will learn the rules, techniques and strategies to begin playing matches. The focus builds the skills necessary for you to be able to play in the Monday Night House League. To register, please speak with Cole Osborne at 905.475.0350 ext. 3237 or at parkwaysquash@mayfairclubs.com. Doubles League meant for A and B level doubles players. To register, please speak with Cole Osborne at 905.475.0350 ext. 3237 or at parkwaysquash@mayfairclubs.com. Improve your game through a variety of drills and condition games focused on specific aspects of squash, including length, volleys and short game. Intended for those players already comfortable with the basic elements of the game of squash. To register, please speak with Cole Osborne at 905.475.0350 ext. 3237 or at parkwaysquash@mayfairclubs.com. For those who love competition and meeting new friends, our annual Singles, Doubles and Mixed Doubles Tournaments are coming soon! Prizes for the winners and finalists in each draw. Your entry fee includes a minimum of 2 matches in each event, the Championship Awards Night Dinner and Party. Prizes for the winners and finalists in each draw. The Singles Club championships will begin the first weekend in April and run for two weeks. Mayfair Parkway will offer A, B & C/D divisions for the Men and both A & B/C divisions for Women. All matches except the semi-finals must be competed before April 14th. All semi-finals matches will be played April 15th and all finals will be played on April 17th. The Doubles Club championships will begin the third weekend in April and run for three weeks. Mayfair Parkway will offer A, B & C/D divisions for the Men and both A & B/C divisions for Women. All matches except the semi-finals must be completed before May 9th. The semifinals will be played Thursday May 9th followed by the finals on May 13th. Dinner will follow the finals. To register, please speak with Cole Osborne at 905.475.0350 ext. 3237 or at parkwaysquash@mayfairclubs.com. Mayfair Parkway is proud to host the Squash Ontario Junior Silver #7. All juniors are encouraged to register as this is a great opportunity to test your skills against other Juniors. To register please visit the Squash Ontario website. Did You Achieve Your New Year’s Fitness Resolutions? After an unexpectedly severe winter, spring is quickly upon us! Now is the perfect time to reignite your nearly forgotten New Year’s resolutions and make those goals a reality! Our Fitness Manager, Joe Harwood, can help you to achieve your fitness and lifestyle goals. To book a complimentary Mayfair Athletic Analysis, please contact Joe at 905.475.0350 ext. 3252 or at jharwood@mayfairclubs.com, or just stop by Joe’s office on the gym floor. The Junior & Senior Off-Season Hockey Training Programs focus on increasing strength, speed, energy systems and explosiveness. This comprehensive 11-week / 45 workout program takes a phased approach to the off-season, recovering from the previous season, strength and energy systems training and developing speed & explosiveness. With Spring just around the corner, there is no better time to hone your aquatics skills and prepare for a summer of fun in the water! Parkway’s Spring Swim session kicks off on Monday April 15th and we’ve already begun accepting registrations! Adult and Youth programs are readily available, ranging from pure beginner to advanced Master swimmers. If you or your children are looking for a new form of fitness, rehabilitating an injury, or trying to improve your game off court – the pool is an excellent choice for you! To register please Contact Kevin Power at 905.475.0350 ext. 3267 or at parkwayaquatics@mayfairclubs.com. Mayfair Parkway now offers even more junior programs to keep your little ones engaged and active this spring. From a new and improved Soccer Program, a dynamic Kids MMA, Sunshine Kids Yoga, Group Basketball and pick up sports, we offer something for all ages and skill levels. A mixed martial arts inspired program designed for kids 7-12. Working with an instructor, participants focus on basic fundamentals to develop body awareness, coordination, conditioning, balance, strength and confidence. To register please contact Kevin Power at 905.475.0350 ext. 3267 or at parkwayaquatics@mayfairclubs.com. Sunshine Kids yoga is centered around positivity and playfulness while focusing on balance and concentration through yoga poses. The fabulous Corrine Sunshine introduces participants to breath-work and meditation through stories, music and obstacle course. To register please contact Kevin Power at 905.475.0350 ext. 3267 or at parkwayaquatics@mayfairclubs.com. Our programs offer a low teacher to student ratio, allowing players to quickly progress in their game. This program is designed for kids ages 4 – 12 to develop fundamental skills in shooting, dribbling, passing, ball handling, while building on athleticism and confidence. Classes are an hour in length and customized to meet the needs of each participant. Join us on Tuesday evenings or Saturday afternoons in April. Semi-Private and Private training also available. To register please contact Kevin Power at 905.475.0350 ext. 3267 or at parkwayaquatics@mayfairclubs.com. 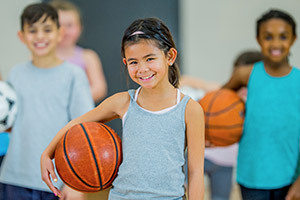 Either once or twice a week, Kids Sports in the Multi-Gym is two hours of structured sports play with an instructor designed for kids ages 4 – 12 at all skill levels. Our instructors guide players through organized activities like basketball, soccer, hockey, badminton and more! To register please contact Kevin Power at 905.475.0350 ext. 3267 or at parkwayaquatics@mayfairclubs.com. The junior soccer program is tailored to the needs of each participant and will guide them through a progression in various sport related skills such as passing, shooting, footwork, speed and agility. Our low student to teacher ratio allows for participants to quickly work through a progression and fine tune their skills. To register please contact Kevin Power at 905.475.0350 ext. 3267 or at parkwayaquatics@mayfairclubs.com. For more information or to schedule your appointment, contact (905)-475-1530. Save 10% on all squash gear. All regularly priced, in stock squash racquets, bags, shoes and googles are now 10% off until April 30. Please ask for details.